Finally got around to buying a drink in this pub after finding it closed a couple of years back. Credit to the landlady, she did apologise when I sent her an email about the incorrect published opening times on my previous aborted visit. She even offered to shout me a pint, on my return. I wasn't sure she'd recall that though. So I paid the usual amount. 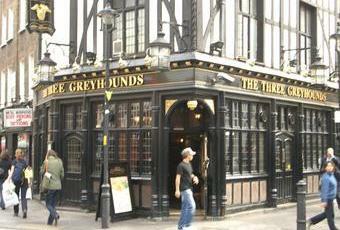 The Three Greyhounds is yet another Nicholsons pub in the West End. It's a fairly small place with a singe ground floor bar and downstairs toilets. A good place for people watching and it's quite an airy space in the summer. Ales were Sharps Doom Bar, Leeds Midnight Bell, Fullers London Pride & Nicholsons Pale Ale. Ciders were Thatchers Heritage and Westons Old Rosie. Seems to attract its fair share of drunks and is therefore typical of the pubs in this area. But probably also one of the best in the area. Last straight pub before you hit the old compton. Really not much on tap, but what they do have is well kept. We often pop in here for a couple as it is a great pub for some people watching. Road is little used by cars so getting a seat outside in Summer can mean we are here for several rounds. Be prepared to deal with the beggars, flower sellers and cycle ricsshaws, we actually enjoy their visits now, pretending to be Border Patrol or 5 o and see them run away. Last pub of my 3 in Soho in one afternoon. Nice apricot style glass drop lights hanging. Wooden floor throughout with rather a attractive brass foot stand at the bar with Griffins on stands. Disappointed to find this pub closed yesterday morning, despite its website claiming it opened at 10am. The 2013 Good Beer Guide also displays incorrect information. 0/10 for a pub that does not serve beer at advertised opening times. Revisited yesterday as part of a crawl through Soho - decent (albeit small) Nicholson's corner pub, mock Tudor exterior but little of merit inside. Decent welcome and a good range of six ales - I had the Hook Norton's Hooky Bitter which was a very nice and well-kept ale.